Victorelli v. Shadyside Hospital, 128 F.3d 184 (3rd Cir. 1997) (Family and Medical Leave Act). The Pennsylvania Bar Institute, the Pittsburgh Chapter of the National Employment Lawyers Association, the Allegheny County Bar Association, and other professional groups frequently call upon Jim to conduct seminars. He published “Handling Cases Under the FMLA” in Trial Magazine. He was also named as a leading Pennsylvania Employment Law attorney in the 2003-04 edition of Chambers USA Guide to the Legal Profession. The publication notes that Jim “won praise for his dedicated work on behalf of individuals.” Jim has been named a Pennsylvania Super Lawyer by the publishers of Law & Politics Magazine and Philadelphia Magazine every year since its inception in 2004 and has been listed in The Best Lawyers In America® continuously since 2006. Jim was elected as a Fellow of the Academy of Trial Lawyers of Allegheny County in 2003 and the College of Labor and Employment Attorneys in 2009. He is rated AV® Preeminent™ by Martindale Hubbell and has had that rating for over 30 years. Jim was recently named Pittsburgh Employment Lawyer of the Year – Individuals by The Best Lawyers in America®. In addition to his legal career, Jim has served community interests throughout his career. Jim has been a member of the Swissvale Zoning Board of Adjustment from 1986 to the present and has served as Chairman since 1990. He has served on boards and in leadership positions for the Neighborhood Legal Services Association, Shady Lane School Board of Trustees, and the Mexican War Streets Society. Jim has also been active in the Equal Justice Under Law Campaign, Indigent Divorce Panel, as well as Project Challenge. 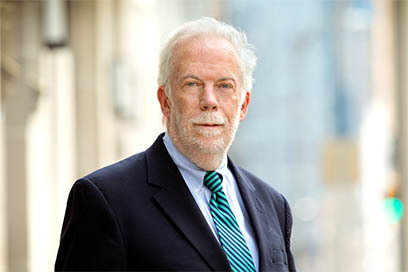 Jim is the 2003 co-recipient of the Marjorie Matson Award for Civil Liberties and Civil Rights awarded by the American Civil Liberties Union of Greater Pittsburgh. In September 2005, Jim received the inaugural Jeffrey A. Ernico Award from the Pennsylvania Bar Association for support of legal services to the public. In 2006, he was selected by the Women in Law Division of the Allegheny County Bar Association to receive an Honorable Carol Los Mansmann Helping Hand Award, recognizing those who assist and mentor women attorneys. Jim earned his B.S. from Georgetown University and his J.D. from Villanova University. An active member of the Allegheny County Bar Association, Jim’s participation has been marked by a variety of leadership positions. Most notably, he is served as President of the Bar Association for 2004-2005 and sat on its Board of Governors for over 10 years. Jim was a founding member and past Chair of the Bar Association’s Civil Rights Committee. He was an active member of the Women In Law Division; Fee Determination Committee; Federal Court Section, as well as the Labor and Employment Section. Jim served five years as an elected member of the Judiciary Committee and was elected by the Judiciary Committee to serve as Vice-Chair (2000-2001) and Chair (2001-2002). Jim is also a member of the Pennsylvania Bar Association (past member, House of Delegates) and American Bar Association; the American Civil Liberties Union (Legal Committee); and the National Employment Lawyers Association (NELA). In 2013, he was elected Affiliate Chair of the Western Pennsylvania Employment Lawyers Association (WPELA), the local chapter of NELA, serving a two-year term.